Less than the sum of its parts, Ruben Fleischer (Zombieland) helms Gangster Squad, a lightweight crime drama set in 1940s Los Angeles. 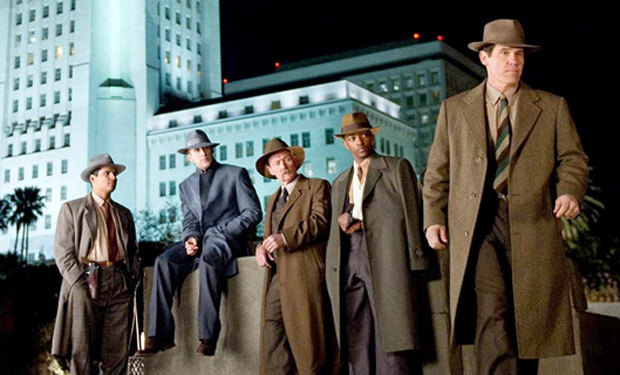 Inspired by the real life story of vicious mob boss Mickey Cohen, Fleischer’s sumptuous thriller brings with it a stellar cast of Hollywood’s finest. Josh Brolin, Ryan Gosling, Sean Penn, Nick Nolte and Emma Stone lead the charge, backed up by the likes of Robert Patrick and Michael Pena. After moving to LA from the East Coast, Cohen (Penn) has taken control of the town. With police officers and politicians under his thumb, only a fool would consider taking him down. Police Chief Bill Parker (Nolte) instructs Sergeant John O’Mara (Brolin) to wage war against Cohen and his men, and he’s only too happy to oblige, bringing together a ragtag bunch of loose cannons in order to get the job done. 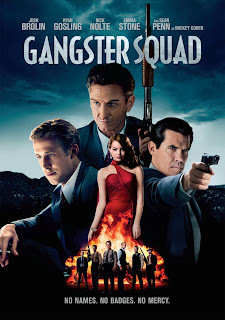 Most of the characters appear to have fallen from the pages of a comic book and Gangster Squad lacks realism as a result. A fine cast is on hand to cover over the cracks but performances are all over the place. Penn chews up the scenery in every frame, lacking genuine menace with his pantomime theatrics. Brolin is solid but O’Mara is hard to relate to. He gets pretty much everything wrong, relying on Wooters (Gosling) to bail him out at every turn. Worse still, his family man sanctity – shoehorned in whenever emotional weight is required – wavers from one scene to the next.